Feeling blue about the lack of updates? Clinging desperately to low resolution prop screenshots occasionally uploaded on the wiki? Tired of being cruelly mocked by the rest of humanity for your unwavering faith in “the final victory”? Never fear. 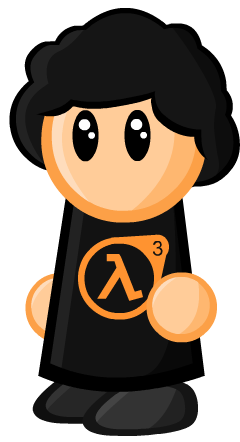 While it’s true that Black Mesa and Ep3 are in a tight contest for “Most Anticipated Half-Life Game That Nobody Even Knows is Alive or Not” you don’t have to agonize over it anymore. What I’d do is this. Get some very, very powerful sedative.. like crush a pack of sleeping pills up and dump it in your Spaghettios. Then write a note that says “Dear Mom. Wake me up at the end of 2010.” Ok now don’t screw this up.. don’t misplace the 1 and the 0 and it be 2100. Or make your 0 squished so she thinks its 2011. End of 2010. Still waiting… Maybe 2013 is the lucky number. LMAO. Of course it won’t be. These guys are so slow, it makes my fingernail seem like they’re growing at light speed. your copy pasted put down does noting to refute the inherent truth in his post. This is vaporware and I’ll believe it when I see it. 2. “Inherent truth”? If I didn’t know any better, I’d say you’re him, posting under a different name. It is the 6th year of development and I think it’s enough to call it vaporware but not the Team Fortress 2, Episode 3 or the Duke Nukem Forever type. Using that definition, yes, it is vaporware. And those two don’t see the project that way, either. They’ll still play it, though. Everyone stop whining, the best way to experience this mod is to just go play Half-Life 1! Simple. What you have just said is one of the most insanely idiotic things I have ever heard. At no point in your rambling, retarded, illogical, and incoherent response, were you ever close to what can be considered a rational and intelligent thought. Everyone in this website is now dumber, thanks to your stunning display of pure idiocy. I award you no points, and may God have mercy on your soul. Tears of joy and hapiness. They said this last year. I will believe it when it’s out. Well now thats some good new!